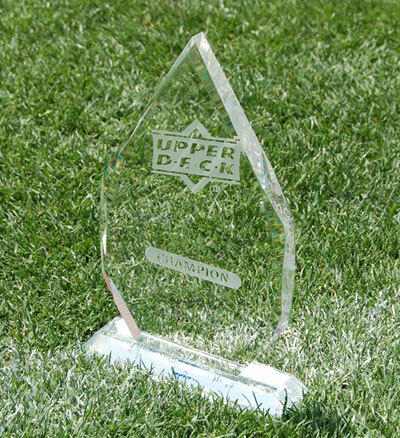 The Upper Deck Awards: Nominate Your Favorites Now! When we started UpperDeckBlog.com about a year ago, a big motivating factor was to get involved with the passionate online communities that are dedicated to the hobby. Whether it’s opinionated blogs, forum communities or box breaks (a great concept that has been around for years), there are so many ways for collectors to get involved, and make their hobby into a shared experience. We’ve been fortunate enough to bring some of the top hobby bloggers on board here to do features for us, but we also monitor forums, blogs and box breaks closely, so that we always have the pulse of our customers. It’s something we take a lot of pride in, and we were happy to see Voice of the Collector rank us #1 in the industry for social media last year. We will be giving out three awards: Best Online Community, Best Blog and Best Video Box Breaker. The top five in each category will receive exposure on Upper Deck’s official websites and social media outlets. Want to nominate your favorites? Click on the links above, and post your nominations as comments on each trophy’s photo page. Once voting starts, we will provide a link to a URL where you can cast your ballot for the final winner in each category. The Best Online Community will receive: a trophy, a variety of unopened product, a LeBron James UDA basketball and a 2009 NFL Rookie Photo Shoot signed football (autographed by more than 25 players) to use as giveaways with their community of loyal collectors. The Best Blog will receive: a trophy, a variety of unopened product and a 2009 NFL Rookie Photo Shoot signed football. The top five Video Box Breakers will receive a box of product to break and review, which we’ll post on Upper Deck Diamond Vision. The winner will receive product from us throughout the year, and all of their box breaks will be featured on Diamond Vision! Nominations have started, so make sure you visit our Facebook page and recommend your favorites today! Voting will start on March 29, and we’ll announce the winners on April 7. Keep checking this blog and our social media outlets for the latest! The Upper Deck Awards Have Been Announced! Vote Now for the Upper Deck Awards!